Where are those tears of pure, transcendental love? Where is that unending thirst to hear about Krishna, to talk about Him and to chant His holy names? Where is that burning desire to go out and spread the glories of the Lord and where is that hankering to render more and more, pure and unalloyed, devotional service unto the lotus feet of Their Lordships Sri Sri Radha-Krishna? I always heard how Sri Mayapur dham is non-different from Sri Vrindavan dham. I always cherished experiencing it and I always knew such an experience was possible as the words spoken by Vaishnava acharyas cannot be wrong. Known as gupta Vrindavan, or hidden Vrindavan, Sridham Mayapur is bound to be an eternal mystery for almost all of us. And Sridham Vrindavan, being the summom bonum of the most confidential mellows of devotional service relished by the eternal loving devotees of Their Lordships Sri Sri Radha-Krishna, is even more mystical in that in Sridham Mayapur we have the mercy of Lord Chaitanya to help us understand those most confidential mellows but in Vrindavan we are, in a sense, on our own unless, of course, we carry the mercy of Sri Sri Nitai Gaura and Sri Mayapur dham. With the confidence that I had some mercy of Sri Sri Gaura Nitai and Sri Mayapur dham, and with the hope that I will be able to carry it with me, last year I decided to participate in the annual 84 Kroshas Vraja mandal parikrama and walk around the 12 forests for 30 days during the month of Kartik. 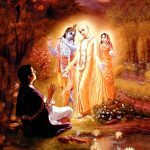 One thing is sure- and I keep telling this to people- if one cannot see Vrindavan in Mayapur, where Lord Chaitanya’s mercy, which helps one understand Vrindavan, is available in abundance, he or she has no possibility of seeing Vrindavan in Vrindavan. Said differently, a person who is able to see Vrindavan in Vrindavan, can definitely see it in Mayapur too. But if Vrindavan is non-different from Mayapur and if Vrindavan can be seen in Mayapur, then Mayapur also can be seen in Vrindavan! I do not claim seeing any spiritual mystery but walking through the forests and lush farms in Vraja dham I did think this was possible as some areas sounded so familiar although I was seeing them the first time, at least in this life. At many places I naturally felt at home, very comfortable, although apparently it was austere. I just did not like leaving those places but we had to move on. The residents of Vraja dham, especially the children and the elderly, left a lasting impression on my heart. Their innocence, affection towards guests and unpretentious generosity were something that I miss in other villages these days. Their spontaneous “Radhe Radhe” touched me deeply. The unforgettable sweet memories of the lakes, trees, flowers, birds, especially the peacocks and parrots, the forest animals, and the most beautiful, peace personified cows became a permanent spiritual asset to my life. Some of the songs I heard during Vraja mandal parikrama knocked on my inner, dormant emotions and spiritual aspirations. Honestly speaking, I am restricting my expressions here as they may not go well with every reader, but what I experienced in Vraja dham, including the feel of the dust of that supremely holy land, goes beyond my ability to describe. How was this possible if not because of the mercy of Sri Mayapur dham? On one hand I feel content that I received more than what I deserved but on the other hand I am not at all satisfied. Where are those tears of pure, transcendental love? Where is that unending thirst to hear about Krishna, to talk about Him and to chant His holy names? Where is that burning desire to go out and spread the glories of the Lord and where is that hankering to render more and more, pure and unalloyed, devotional service unto the lotus feet of Their Lordships Sri Sri Radha-Krishna? Certainly I need more mercy of Sri Mayapur. Reasonably, my attention goes back to Gauda bhumi and I remember Madhai ghat. Jaghai and Madhai, the persons who committed more sins than Chitragupta’s book can register, were specially favored by Lord Nityananda. For this reasons, Madhai ghat strengthens my hopes for spiritual awakening. Sriman Nityananda Prabhu told Jiva Gosvami that ten meters north of Madhai ghat lies one ghat that attracts the minds of the townspeople. 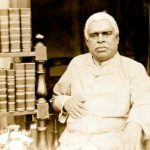 “”Hearing this, Jiva then said, “One question has arisen. Please listen. 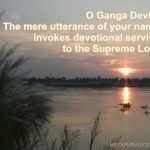 When Ganga Devi again uncovers Mayapur, by what signs will the devotees be able to rediscover the concealed sites?” Hearing this, Nityananda Prabhu answered with nectar-like words, “Listen, Jiva, when the Ganges covers this place, one corner of Mayapur will remain intact. Many yavanas will take up residence there, yet the name will remain Mayapur. About one thousand meters southwest of the remaining place, one will see a slightly raised area covered with vegetation. That will indicate Jagannatha Mishra’s house. Ten meters from there is the Vriddha Shiva temple. From such measurement one will be able to discern everything. A pond called Shiva-doba will be seen, indicating the previous bank of the Ganges. In this way, by the Lord’s wish, the devotees will reveal the lost places. Know this for certain. At the end of four hundred years, the task of recovering the lost tirthas will begin. Sri Jiva said, O Lord, what is the reason for the name Antardvipa? Thinking like this, Brahma began meditating and performing austerities in Antardvipa. After many days, Gaura chandra mercifully came and said, “O Brahma, I am satisfied with your austerities. I have come to fulfill your desire.’ When Brahma opened his eyes, he saw Gauranga and fell to the earth unconscious. The Lord put His foot on Brahma’s head, and Brahma was enlightened with transcendental knowledge and began to pray. 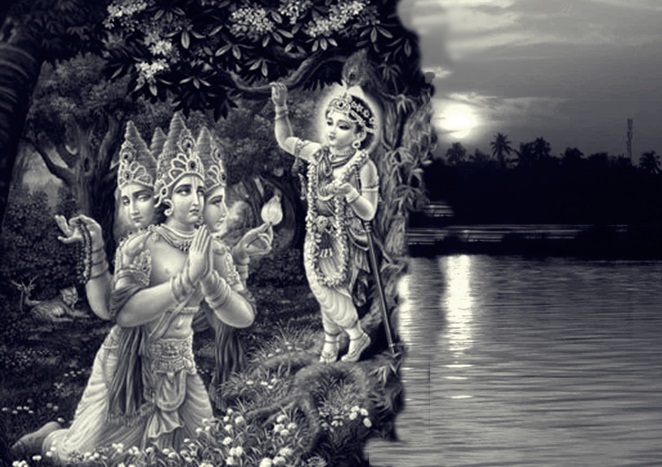 Hearing Brahma’s prayers, Lord Gauranga benedicted him saying, “So be it. When My pastimes become visible on earth, you will take birth in a yavana’s house. Your name will be Haridas Thakur, and you will be famous for your humility and completely free from all pride. You will chant three hundred thousand names a day, and when you pass from this world you will be seeing Me. And at the end of the second one hundred trillion years of your life, you will attain Navadvipa dham and be absorbed in eternal rasa. What can be more astonishing than this! The Supreme Lord Himself says there is something beyond His experience and that He will appear in kaliyuga to relish it! It was so confidential that He revealed it only to the top person in the universe, Lord Brahma, and told him to keep it secret. 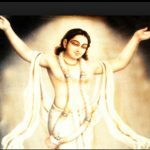 We need to realize the depth of Lord Gauranga’s statements in order to appreciate how fortunate we are today to have known what He told Brahma. There is something more to it. We have been living in the age which is only a few hundred years from Lord Chaitanya’s just concluded earthly pastimes. We are among the first ones to have heard and talk about Sri Chaitanya’s appearance in this kalpa, or during this day of Lord Brahma. 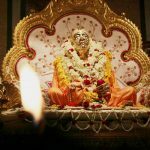 We are blessed by His disciplic succession through the six gosvamis and Srila Prabhupada and given the extremely rare opportunity to spread His teachings wherever we go. Lord Chaitanya has instructed jare dekho tare kaho krishna updesh- deliver the message of Lord Krishna wherever you go and to whoever you meet. What can be said then of the great fortune of those who not only hear and spread it but also reside in the very place where He appeared, Sridham Mayapur! With these historical events and abundance of mercy from Lord Chaitanya by its side, Sri Mayapur dham indeed makes it a lot easier for devotees to appreciate Sri Vrindavan dham, and this is the reason Gaudiya devotees generally visit Mayapur before visiting Vrindavan.